Using polylines as distance rulers in R? I am working on a project where I need to use this particular method but am not sure how. I would prefer to do it in R.
I have a polyline running parallel to the coastline (which is a polygon). I need to find the distance from the polyline to the coastline at 100 meter intervals. 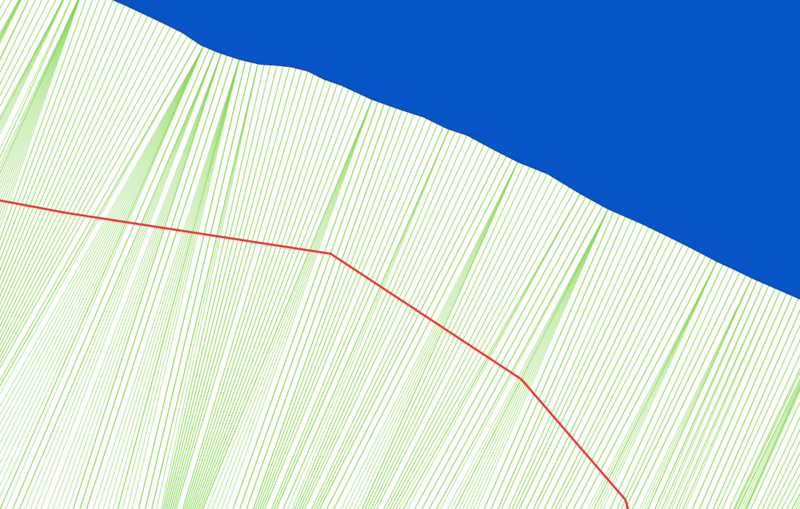 To do this, I need to create polylines extending from the coast every 100 meters. These polylines are to function as rulers. The distance of the polyline of interest from the coast will be measured by their intersection with these measurement polylines. I can't figure out how to store the length of the polyline as continuous data. That is, wherever an intersection occurs, there will be a measurement of the exact distance from the coastline. I can't figure out how to store the distance measurement from the intersection as an attribute in the polyline of interest. Attached are visual examples of the data. First with the polyline of interest (red) and the coastline (blue), and then the second image with the polyline "rulers" added in (green). Browse other questions tagged r distance or ask your own question. Measuring distance to coast in specific direction using PyQGIS? Subset polygon data of SpatialPolygonsDataFrame by Distance to a Set of Coordinates in R? Clipping section of polyline based on given distance from source point feature along that polyline using ArcMap?